We truly enjoyed our stay at this beautiful home. The house is very well thought out for a perfect holiday with family. It has all the necessities you will need for your stay. We especially loved the open and spacious kitchen as well as the cozy den. The beds were comfortable and every room having its own ensuite bathroom is a great feature. We would not hesitate to return to this home if we should ever find ourselves back in Ireland and we certainly hope that we do! Our only complaint is that we couldn't stay longer. We loved everything about our stay here! The house was big and beautiful and Seamus is such a thoughtful host! He chatted with us and gave great recommendations about the area and where we were headed on our next leg of the journey. Wish we could have stayed in this home longer it was amazing! 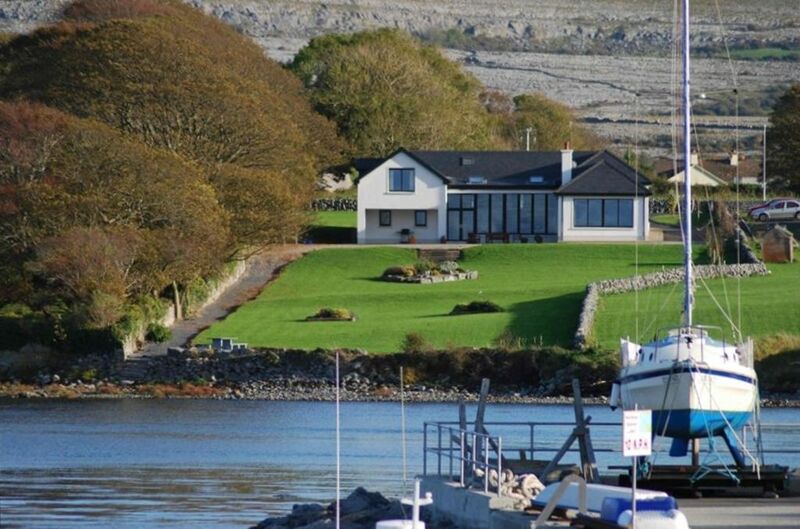 House is as specified, very spacious rooms with gorgeous view of the bay and of the magical Burren. My husband even enjoyed being a woodsman for the stay tending to the fire in the mornings and the evenings. Was plenty warm in the house with the fire despite it being late October. Highly recommend staying at this house for the relaxing accommodations as well as the quaint area of Ballyvaughan to see some sites on the Wild West coast. We really enjoyed our stay at the house and would recommend it. The accommodations are very nice and the view from the house is beautiful. The kitchen is large, airy and great for a large group. The 8 of us had plenty of room and were very comfortable. The living room also was very spacious and was a favorite for evening gatherings in front of a fire, where we relaxed and discussed our plans for the next day. It was very nice that all of the rooms are similar, so for 4 couples it was perfect. The town near the house is also great. There are several places to eat and some very nice pubs and whiskey bars. Seamus was very helpful and gave us good recommendations. A great stay in a clean, well maintained/provisioned, roomy accommodation. Thank you. Seamus and Mary are the kind of couple you won't find anywhere else. They are so lovely and sweet. They made this trip so enjoyable. And the house was just beautiful. It accommodated all 12 of us perfectly! Having a bathroom in each room was extremely convenient! The pictures didn't do it justice, the views from the house and the house itself are just breathtaking, you have to see for yourself! Please if you are viewing this house as a potential rental home, don't even look anywhere else, this is the perfect home! There is also a five minute walk into the cutest town ever where you can find cafes, restaurants, and shops! It's perfect for anyone loooking to spend time in Ireland. Again, Seamus and Mary were very hospitable and I would definitely come back if I ever go to Ireland again. Thank you Seamus and Mary for our lovely stay!! We booked Sycamore House for a weekend get together of 15 , including 2 children and could not have been happier with the house. The photos do not do it justice. Spacious, clean, beautifully designed and very well equipped it comfortably held our big group and the views from the kitchen/ dining room were unreal. We loved getting a roaring fire going at the end of the day and having the sea on your doorstep was a great bonus. Seamus was incredibly kind and helpful throughout and very quick to respond to our many queries leading up to the stay. Would highly recommend!